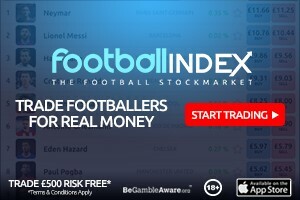 Here’s our fantasy premier league defender tips GW9 article where we give our defender and GK player rankings for gameweek 9. There’s a comprehensive table of stats and player suggestions to help you make a transfer choice. There’s player suggestions at the end if you want to skip all the stats preamble. 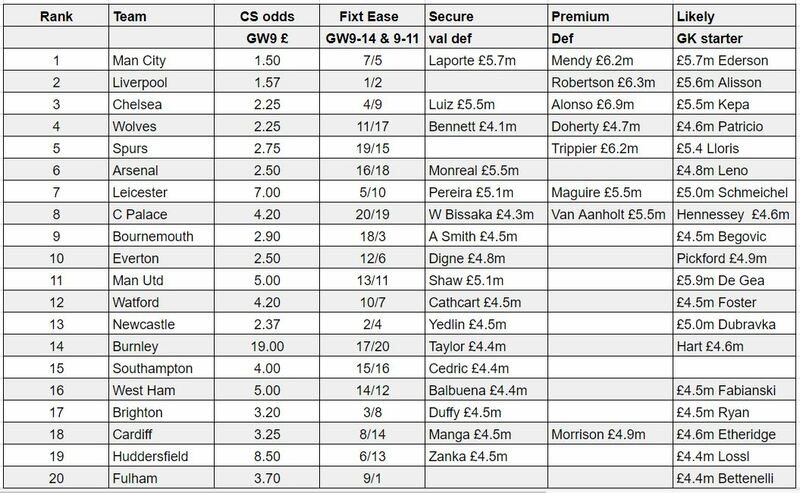 bookies odds for a clean sheet for GW9. The lower the better obviously. Andrew Robertson £6.3m Liverpool – If you haven’t got a Liverpool defender vs Huddersfield would be a good time to do it. The Man City game saw the 2 cheapest options of £5.2m Alexander Arnold and £5.1m Gomez see some changes. Alexander Arnold wasn’t in the starting lineup (not injury related) and Gomez moved to RB with Lovren coming in at CB. My own view is that both TAA and Gomez will hold their places but only Klopp actually knows what is going to happen so if you’re buying now then Roberston is the safe option. All will be subject to normal top 6 type rotation. Wolves – £4.7m Doherty is worth stretching the budget for in my view. If you’re really wanting to gamble and got little to do in your squad then Newcastle have a good run of fixtures. With little going forward they have no choice but to be defensively minded and at £4.5m you can afford to rotate them for the best fixtures. Yedlin for me is the best option. Any thoughts on my wildcard team? For me. I would downgrade Mane or Salah and upgrade either Westwood or Masuaka. 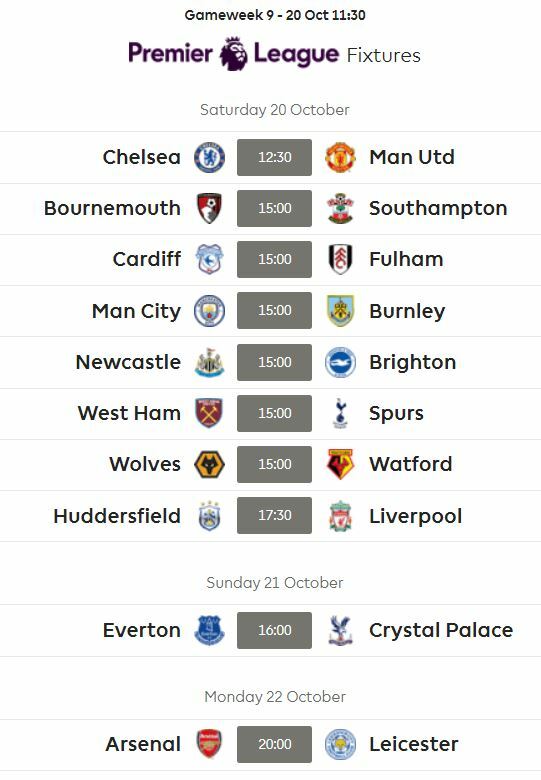 Otherwise you are being forced to play 4 defs every week and you will crash trying to play WBA or Bennet each week, check out GW 11, 12 . Also you could downgrade alonso to luiz if you really want a Chelsea def and gain some spare cash to upgrade WBA/Bennet. I was thinking of holding onto Salah and Mane for the next two gameweeks (Huddersfield/Cardiff) then downgrade Mane to Richarlison and upgrade Westwood to Sigurdsson or Lucas…what u think? So I had Mendy and Richarlison from GW1 and really want them back, but I have 0 funds in the bank. Also GKs arent great. Mane, Holebas and Foster for Richarlison, Mendy and Ederson. I have already made my subs by changing holebas to doherty… Atm i hv no transfers left but im wondering if it is worth 4 points to upgrade any of my current squad ? New to this and getting better but still too many transfers! Do you think TAA will keep his place or better to downgrade Alonso to Luiz and upgrade TAA to Robertson?